Getting traffic from Facebook today is tough. For Marketing, getting value at all from a fanpage is tough. But the one Facebook feature that should be part of your marketing plan is Facebook groups. 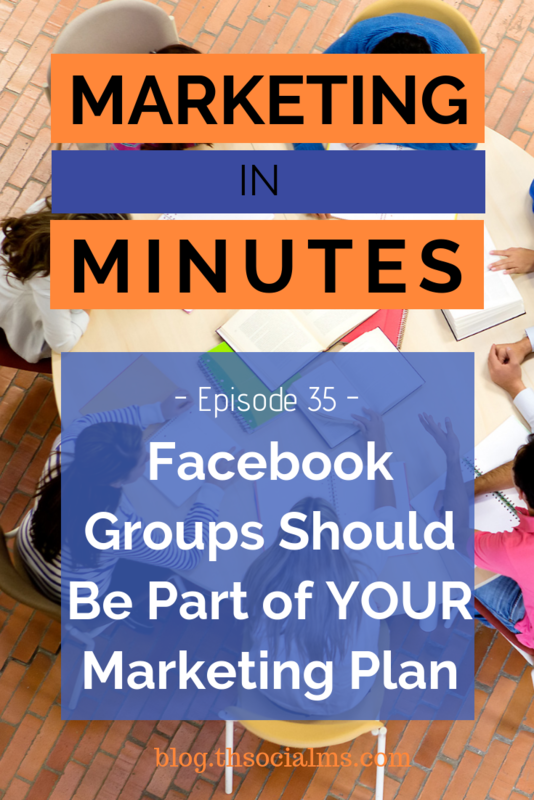 In this episode of Marketing in Minutes, I will show you why and how to use Facebook groups for marketing success – and that is more than just traffic! When you’re marketing your business, Facebook isn’t the easiest place. When you are new to the game, posting to your fanpage probably won’t get you any traffic or value in general. But even today, with Facebook’s algorithm drastically limiting organic reach, you can still get a lot of value out of Facebook. One way to drive traffic and get value from Facebook are Facebook Groups. Welcome to Marketing in Minutes by The Social Ms – the podcast that gives you everything you need to know on one marketing topic per episode. I’m Jonathan Gebauer and today, let’s talk about Facebook groups. When Facebook became interesting for marketers, it was mainly because of fanpages. Back in the early days, they truly allowed you to build an audience for free and push content to that audience. But since then, Facebook has done a lot to limit organic reach of fanpages – so when you’re starting out and don’t have a lot of money to spend, getting traffic or even any kind of value at all from your Facebook fanpage is almost impossible. Seriously: with organic reach of fanpages far below 1 percent, it’s probably not even worth starting your fanpage, at least not if you don’t have the budget to push it with ads. But there is another feature Facebook offers – groups. Groups are basically Facebooks form of discussion forums. And they’re great. There are groups around almost any topic. And while I wasn’t a member of any rescue dog groups until now, I did a quick search on search and rescue dogs on Facebook – and there are many groups. I will probably join some of them. But that’s only to demonstrate that these groups exist for almost any topic. Facebook groups are communities – you can use them to get help, to ask questions about the topic of the group, to organize your company events, or just to hang out with like-minded people. And as a marketer, you can and should make use of that. When you take an active role in the group – posting valuable content, answering questions, showing your personality, nobody will ever see you as a marketer. You won’t get a crazy amount of traffic by doing this – but that is also not the point. In Facebook groups, you won’t just generate traffic and start building a normal social media audience. Facebook groups give you a chance – a chance to build a core audience. These people are already part of the same community you are. If you play your cards right, they can become your brand ambassadors. These are the people who will not just read your content, but also know exactly who you are. They will become loyal to you – and do your promotion for you. This is the true power of Facebook groups. Joining Facebook groups is a very valuable marketing tactic – but you have to remember that it’s not that easy to find Facebook groups that are worth your time. You have to find groups that are active – but not filled with spam content. You have to find groups that you can add value to. But it can be done – and you should do it. The best groups are often closed groups and you need to apply to be allowed to take part. But the awesome thing about this is, that in those groups, members get notifications for new posts. Compare that to the 0.1 percent organic reach of fanpages – and you’ll understand the power of groups. But there is one more thing you need to know about Facebook groups. You can have your own group! Now, this isn’t for everyone – and there is really a lot of work involved. Because you don’t just want to build an open group that anyone can join and post spam to. You want a closed group that people will want to join – and even will apply to join. You will need an audience to start with – nobody will apply to an empty group. You will need to moderate the group. And you will need to take part in the group – answer questions the members are posting and so on. In the end, you want people to become active – but that just means you want them to follow the example you set. But if you do all those things and build a Facebook group, you will do amazing things. You will build a massive brand around yourself, a massive core audience of brand ambassadors. Every member of that group will feel they have a personal relationship with you. Is it a lot of work? Yes, it is – but is it worth it? Hell Yeah! So this is why Facebook groups should be part of your marketing plan. So what about you? Are you already using Facebook groups? Do you have your own Facebook group? If you want, let me know – leave a comment on the show notes or send me an email. I really want to know! I hope you enjoyed this episode of Marketing in Minutes – check out the show notes for more information on Marketing with Facebook. You can find them at blog.thesocialms.com/MiM-35… that’s blog.thesocialms.com/MiM-35. Please subscribe to the show – and if you want to help us grow our audience, leave a review on Apple Podcasts.